Housewives demonstrating for more meat, 30 January 1951. Jarrow marchers pasing through Buckinghamshire, 26 October 1936. Woman with two boys and a 'female spirit', c 1920. Servis 'Superheat' washing machine, c 1957. 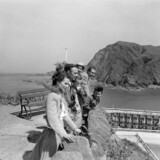 Tourists at Ilfracombe, Devon, 1953. Gary Pierce saves a Liverpool goal, 6 October 1975.